SoJIA is a rare paediatric disease, which may evolve in monophasic, polycyclic and chronic persistent course. Only a few studies have tried to bring out early factors of poor outcome that could lead to manage SoJIA according its severity at onset. To describe presentation and outcome of SoJIA and to determine early clinical and laboratory characteristics associated to a poor outcome. Retrospective study on SoJIA cases diagnosed by ILAR criteria between January 1985 and December 2005 in a tertiary paediatric rheumatology centre. During the study period, 114 children were included. Mean age at diagnosis was 4 years and 4 months (range, 4 months to 15.5 years). Familial history of autoimmunity was found in 27% of the patients. Glycosylated ferritin was low (≤20%) for 79% of patients. 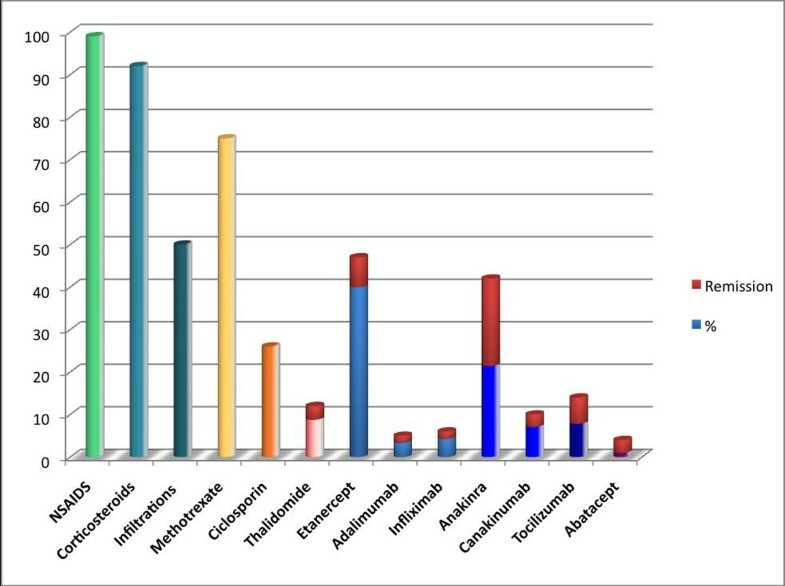 Twelve percent of patients had macrophage activation syndrome, 2 patients anti-neutrophil cytoplasmic antibodies (ANCA) associated glomerulonephritis, 3 patients pulmonary restrictive syndrome without vertebral arthritis, and one patient Crohn’s disease; 11 % had positive antinuclear antibody (ANA) (≥1/160) at diagnosis. None developed neoplasia. Patients in whom diagnosis was made after 2000, and had been treated by biotherapy, especially anakinra, had less osteoarticular sequelae and lower inflammatory syndrome (p = 0,004) than others (Figure 1). Early polyarticular and wrists involvements were associated to a poor outcome (p = 0,009, p = 0,027). This retrospective study suggests that 1) autoimmunity might be involved in the pathogenesis of SoJIA 2) early polyarticular and wrist involvements are associated with a poor outcome 3) anti-IL1 agents’use is associated with an improvement of the outcome.